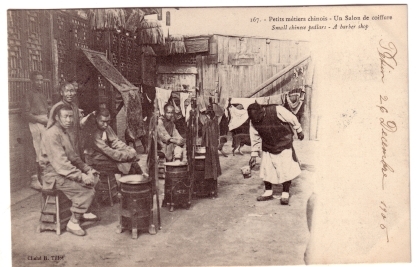 Action: Three men have set up their stool and stove in a north China street and are waiting for customers (or posing for the photographer). Smiling spectators observe the proceedings from around a shop’s entrance, while another man’s action remains unclear. In the back, two dogs stand under a clothesline that someone uses to hide. Image Particulars: The stool drawers hold the barbers’ tools, and both stove and stool are carried on a bamboo pole (here standing vertically against the stove) twhen moving around.